The distance from Lake Havasu City to Topock, Arizona is only about 40 miles. Our route will take us northward along State Highway 95 to Interstate 40, then westward to Topock. Along the way we will explore the river and surrounding environs. River access along this area is isolated to a few put-ins to the north and south, primarily around the Topock and Lake Havasu City areas. Owing to the river flow, most non-motorized boat traffic is from north to south. South of Needles the nature of the river changes as it enters the Topock Gorge area. Flat, riparian shoreline gives way to spectacular rock formations within the Gorge. 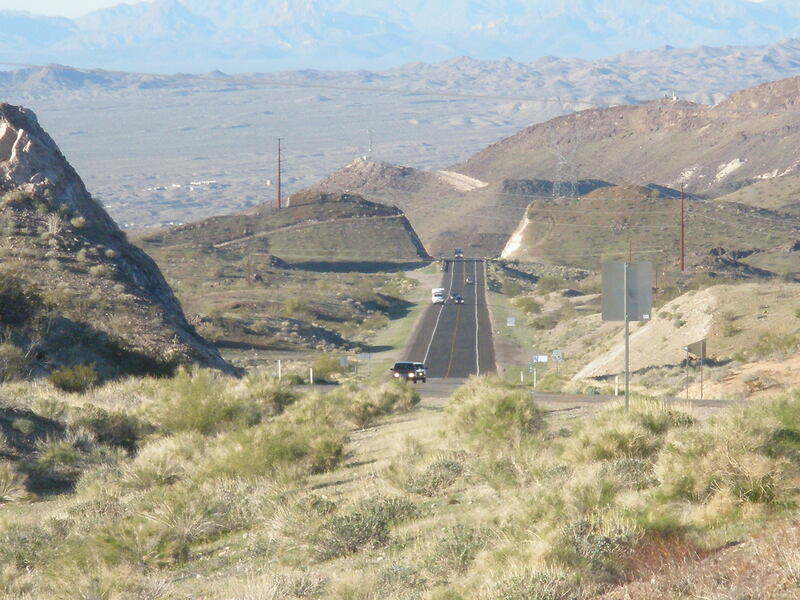 Highway 95 veers northeastward from Lake Havasu City away from the river, with few access points along the way. Highway 95 north of Lake Havasu City. A few miles out of town we come to Desert Hills, Arizona, a census-designated place (CDP) of some 2,183 residents. The Lake Havasu City Airport is on the east side of Highway 95 just past Desert Hills. After the airport, we are back into pristine desert. Castle Rock Bay Road intersects Highway 95 just past the airport and takes a path to Castle Rock Bay on the river. Castle Rock Bay is within the southern-most boundary of the Havasu National Wildlife Refuge. The Bay is used frequently as a haul-out point for canoeists and kayakers. Several dirt roads nearby lead to the shoreline, but there are no improved facilities here. 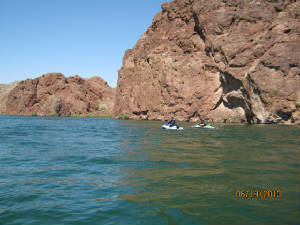 A company called Western Arizona Canoe and Kayak Outfitters (Wacko's) offers kayak tours of the Gorge from Lake Havasu City. They will transport you to Topock Marina at I-40, provide you with a kayak and fundamental kayak instructions, outfit you with paddles, coolers, gloves, dry bags and Personal Floatation Devices (PFD's), send you on your way, and pick you up at Castle Rock. All you need is lunch and water (or other favorite beverage). The rates are $45 per adult, and children under ten are half price. More information is available at their web site, www.azwacko.com. Further northeast from the airport, there is a marked BLM LTVA area on the east side of Highway 95. There are no facilities here, but there are indications of use. The Havasu BLM office manages 1.4 million acres of public land in the Mohave and Sonoran Deserts, along the river, and the uplands to the east. Highway 95 continues northeastward, past the small community of Lake Havasu Heights, and intersects with Interstate 40. We head west in I-40 toward Topock. The Havasu National Wildlife Refuge (NWR) protects 30 miles of river shoreline between Needles and Lake Havasu City. The Refuge is managed by the U. S. Fish and Wildlife Service, and was established in 1941. The Havasu NWR encompasses a total of 37,515 acres, of which 32% is designated wilderness. Plants and animals co-exist with humans in a precarious balancing act, often with competing priorities. The mission of the Fish and Wildlife Service is to protect and restore threatened or endangered animals and habitats, accommodating human recreation all the while. That is not an easy task. Many of the same threatened birds and animals that exist in other Refuges along the river live here as well. The introduction of invasive exotic vegetation like Salt Cedar is a problem here as well, and NWR staff work hard at controlling or removing it, and replacing it with native vegetation like cottonwoods and willows. Another primary goal is to assure suitable habitat for the many migratory birds that stop here on the way north or south. The NWR is divided into three distinct north-to-south segments: The Topock Marsh Unit, the Topock Gorge Unit, and the Havasu Wilderness Unit. The Topock Marsh Unit is north of I-40 and consists of 4,000 acres of natural and restored marshland. The Marsh is actually a series of small lakes where thousands of migrating birds stop to rest and feed (some stay until spring; some never leave). Consequently it is very popular in the winter months when birders come to visit varieties of geese, herons, egrets and other water birds. River water is provided by way of an intake canal at the northern end of the Marsh. Boating, fishing, canoeing and wildlife watching are available at the Marsh, but no swimming. No-wake boating is required near the Five-Mile Landing concession. Restricted boating areas at the Marsh and throughout the NWR are marked with signs and buoys. Overnight mooring of watercraft is available only at the concession, where slips can be rented at reasonable prices. Free boat launches are located in the North Dike and Catfish Paradise areas of the Marsh. Catfish Paradise also offers a fishing Pier. RV and tent camping is available at the Five-Mile Landing concession. Fires are allowed only at the concession. At the Pintail Slough Management Unit in the northern reaches of Topock Marsh, planted wheat, millet and other natural food provide sustenance for the migratory birds. Hunting at Topock Marsh is prohibited between October 1st and the last day of the local quail hunting season each year. Only certain areas of the Marsh are open to vehicular traffic, but hikers will enjoy a large number of foot trails throughout. People wanting to boat, canoe or kayak the twenty miles of Topock Gorge usually begin their trek at Moabi Regional Park. The Park is actually in California, about 11 miles southeast of Needles. Group and individual campsites are available along 2 ½ miles of shoreline. The Park has 35 full hook-up RV sites, 120 water/electric sites, and unlimited tent camping. Rates range from $15 per night per vehicle for a general (no hook-up) site and $22 per vehicle per night for a peninsula site, to $200 per RV per month. Discount and long-term rates are also available. More information is available from their web site, http://www.moabi.com/, or by calling 760-326-3831. Their E-Mail is Moabi@ctaz.com. Topock Gorge begins about four miles south of Moabi Regional Park. Many people begin their adventure from the park, and arrange for return transportation from Castle Rock near Lake Havasu City. Sailboats may make the tour upstream. A canoe or kayak tour will take a minimum of 5 ½ hours of paddle time. Along the way visitors go through some of the most spectacular scenery on the Lower Colorado. The Colorado River narrows significantly where it enters the Gorge, and non-motorized boaters share the narrow waterway with motorized watercraft of all types. This can lead to congestion and accidents. If you are using a non-motorized craft, it is suggested that you make yourself conspicuous by using bright clothing, flags or pennants, or a brightly colored hull. Water skiing is not permitted in the Gorge, but jet boats, inboards and outboards, and river tour boats will generally tear past you in the main channel. All of the inlets, bays, coves and adjacent waterways in the Gorge are no-wake areas. These make for peaceful stop-over areas for those making overnight two or three day trips. The Gorge is marked with colorful place names like Blankenship Bend, Devil's Elbow, Picture Rock, Hidden Bay and Cathedral Rock. Indian petroglyphs are said to be found on Picture Rock. The land on either side of the River is part of the Needles Wilderness Area, meaning you will see no motorized vehicles on shore. You might be fortunate to see wild four-legged residents of the Wilderness, including Bighorn Sheep and wild burros and horses. Here you can almost feel cut off from the world, surrounded by volcanic rocks rising into dramatic spires, turrets and needles. The rusty rock, the greenish-blue water, the golden beach and the green shoreline make for a riot of natural color. The scenery is so spectacular that the happening upon of wildlife becomes an added bonus. At Devil's Elbow, the red rock walls soar hundreds of feet above the water. A passing jet boat sends waves of water and sound pinging back and forth between the sheer cliffs. The cliffs are pock marked with caves and slot canyons at some locations, leading to more exploration. Canoeing through Topock is like floating through a painting. The Sand Bar is a named place where boaters haul up and congregate during warmer weather. It can be a crazy-quilt of machinery and people amidst a cacophony of roaring boat engines. But off-season it is a tranquil, serene place. For the fisherman, the cool, deep waters of Topock Gorge support a variety of game fish ranging from bluegill, largemouth bass, striped bass and trout. An outfit called Captain Doyle's Funfishing Guide Service offers fishing boat tours of Topock Gorge. Ticket sales and the boarding area are located at Topock Marina. For more information visit their web site (http://www.funfishing.net/), or by calling 866-284-3262.  If you plan to fish Topock, you should familiarize yourself with Razorback Sucker and Bonytail Chub. Both are endangered and can be caught here. If you do catch one, you should take a picture of it, release it, and report the catch to a ranger. Back on I-40, we continue westward and reach the final destination of our tour, the town of Topock and the adjacent community of Golden Shores. Topock is located on part of the original Route 66. It is just across the state line from Needles California, but really isn't much of a town any more. While nearby Golden Shores boasts a population of about 3,000, Topock began declining with the advent of the Interstate system and the decline of Route 66. About the best-known thing about Topock that is still in business is Hooch's River Grill. However, back in the 1800's it was a bustling community along the river next to the wooden railroad bridge. 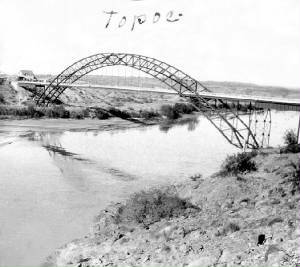 The railroad bridge was replaced by the Red Rock Bridge in 1890. So the railroad had a bridge across the river, but auto travelers had to use the Needles Ferry to get across. But in 1914, a major flood knocked out ferry service. Planks were placed across the rail on the Red Rock Bridge and autos shared the span for a while, alternating crossings with the railroad. In 1916 autos would finally get their own crossing when the Trails Arch Bridge was built. Problem was, the Trails Arch Bridge was a one-lane span, and autos and trucks took turns going east or west. The bridge also had a weight limitation problem of eleven tons, which began to be a problem during World War II. When engineers for the Santa Fe Railroad built a new bridge in 1945, the rails were removed from and repairs made to the Red Rock Bridge, and traffic used it for a while. In 1966 I-40 was built, and a new, four-lane steel girder bridge was built. The Red Rock Bridge was finally dismantled in 1988. What happened to the Trails Arch Bridge, you ask? It's still there. 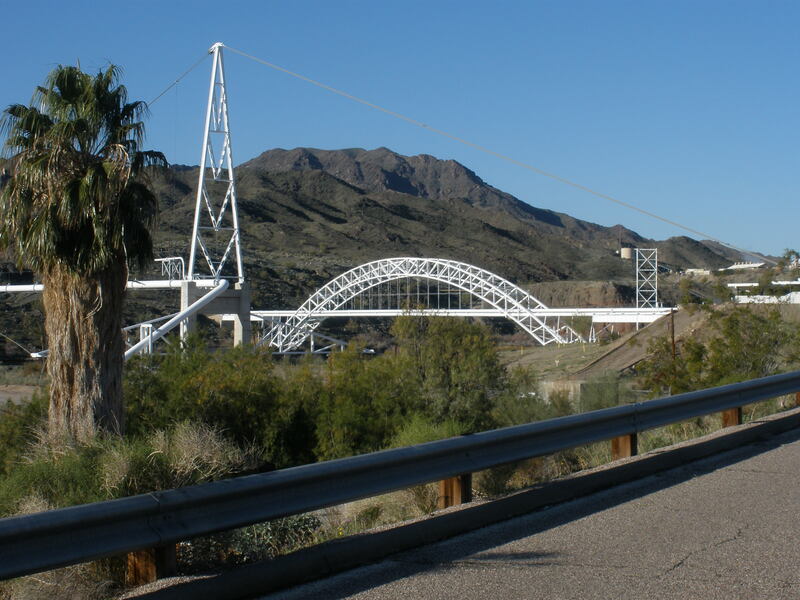 Gas and utility lines are supported by the gleaming white girders of the Trails Arch Bridge. While Topock is in decline, Golden Shores bustles in comparison. But it is also small, and the town snoozes during the summer months after the snow birders leave. There are also true "sun-bunnies" here, people who stay year round or come during the summer months to enjoy their watercraft, night fishing, hunting, or trips to the bright lights of Laughlin. There is only one elementary school in town and no hospital. The annual Route 66 Fun Run ends in Golden Shores each May. The big news for 2007 was the opening of Uncle Bill's Roadhouse Restaurant and bar. The folksy nature of the town can be appealing. Five Mile Landing is a concession-operated enterprise managed by the Fish and Wildlife Service. It is located on the eastern shore of Topock Marsh about five miles north of Golden Shores. It was established in 1956 to provide RV, camping and boating accommodations on the Marsh. The Landing offers about 74 for-fee full hook-up RV sites and 30 for-fee primitive camp sites, a small store, a community building, no-fee boat launching, and a small marina. Camp sites can be used by permit for up to thirty days. RV's wider than 96 inches (not including slide-outs) are prohibited, as are RV's greater than 40 feet in length. Rates and fees were not available on-line at printing time, nor was the name of the new concessionaire. More information about the Landing can be obtained by calling the Needles office of the Havasu NWR at 760-326-3853. The heart of Golden Shores may well be the Brig. General Clifford H. Shuey VFW, Post 6036. The Post offers regularly scheduled events, cheap snacks at the canteen, a Men's and Women's auxiliary, community service announcements, and more. Back on I-40, we ease into Needles and the end of our tour.